Adhesys Medical announced today that the company has entered into a Licensing and Supply Agreement for its Topical Skin Adhesive with the Aachen-based pharmaceutical Company Grünenthal. The partnership with Grünenthal is of great significance for us. We are looking forward to launching our first product together. Adhesys Medical announced today that the company has entered into a Licensing and Supply Agreement for its Topical Skin Adhesive with the Aachen-based pharmaceutical Company Grünenthal. Adhesys, which was founded in Aachen, Germany develops one-of-a-kind polyurethane-based surgical adhesives. Under the agreement the company grants Grünenthal the right to commercialize its Topical Skin Adhesive in Europe and Latin America. Both companies pursue the common objective to launch a medical device that meets highest standards. A key element is the conduct of appropriate clinical trials, which the partners will pursue together. The Agreement was announced at last night’s “Future Lab Gala” organized by the City of Aachen in connection with the City’s “Future Lab Aachen – Science Year 2016” initiative. 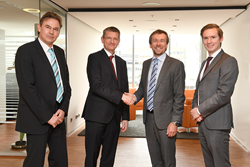 “The partnership with Grünenthal is of great significance for us. We are looking forward to launching our first product together,” said Alexander Schuller, President of Adhesys Medical Inc.
Paired with Grünenthal’s strong footprint in Europe and Latin America and their expansion into the surgical care market, the introduction of Adhesys’ Topical Skin Adhesive has the potential to greatly impact current wound closure practice. “We are very pleased to announce the partnership with Adhesys Medical. With the innovative surgical glue, we will be able to offer surgeons and patients a true alternative to current methods of topical wound closure,” said Klaus-Dieter Langner, Ph.D. and Chief Scientific Officer of the Grünenthal Group. The innovative surgical adhesive is designed for wound closure on the skin. The polyurethane-based platform technology is exceptional, as it combines strength and flexibility. It is a true alternative to common methods of topical wound closure such as sutures and staples. Based in Germany and the United States, Adhesys Medical currently has two product lines under development: the topical application, which shall be commercialized by Grünenthal in Europe and Latin America, and a product for use inside the body. Founded in 2013, Adhesys Medical has grown to a team of 10 and has expanded to the United States, with an office in Houston, Texas. With a first product on the verge of commercialization in Europe and Latin America, the company now seeks to obtain FDA approval for its Topical Skin Adhesive to launch it in the United States with a suitable partner in the coming year. For this purpose as well as for the realization of a clinical study for the internal sealant, the company seeks further financing in 2017. Adhesys Medical was started in 2013 in Aachen, Germany, by Dr. Heike Heckroth, Prof. Dr. René Tolba, Prof. Dr. Malte Brettel, Marius Rosenberg and Alexander Schueller. In a first financing round (closed in January 2014) the company received funding from the Seed Fund Aachen II (http://www.seedfonds-aachen.de/), the KfW Bank and private investors. In April 2014 the team won the Rice Business Plan Competition in Houston, Texas and $500,000 in investment prize money. After receiving further financing from the U.S. investors, including the GOOSE Society of Texas and OWLS, the Rice University Alumni, Adhesys Medical opened an office in the United States, from which the company manages the commercialization, U.S. regulatory and financing activities.